Like clockwork, Pepsi Japan releases a new crazy flavor every summer. In the past, there's been Ice Cucumber (blergh) and Shiso (not bad!). And this year, the flavor is "Salty Watermelon". Let's give it a whirl. As previously posted, watermelon is very much a summer food in Japan, where people are known to sprinkle some salt on it to bring out the flavor. No wonder the Salty Watermelon Pepsi label reads, "Refreshing taste of summer". There aren't any big surprises in unboxing. The packaging shows a round watermelon, a beach, some clear blue sea and clear blue sky. 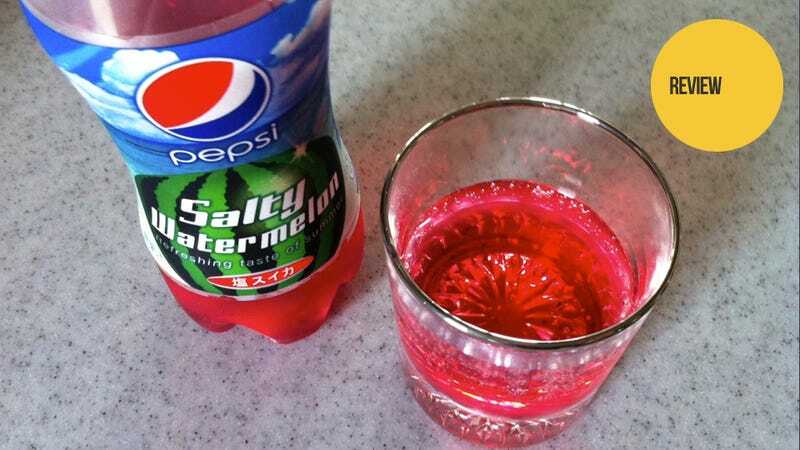 Opening the Salty Watermelon Pepsi is like opening any Pepsi: you twist. What I was surprised was just how faint the watermelon scent was. It's a hint of watermelon, and not that overpowering candy watermelon smell you find in bubblegum. The color, however, didn't really look like watermelon red. It looked more like cough syrup red when poured—or watered down watermelon red. It's more pink than red and looks better in the bottle. In a glass, it doesn't exactly scream "drink me". The taste is very, very dry. Watermelon flavors in soft drinks or candy is often overpowering, but not here. The flavor of carbonated water is more pronounced. It's fizzy, but drinking Salty Watermelon Pepsi doesn't coat your throat in sugary syrup, making for a clean finish. There are salty notes, which means Salty Watermelon lives up to its name, but it also gives the drink more of a grown-up taste. This is the best summer Pepsi I've had since the shiso-flavored one. Then again, it's the only summer Pepsi I've had since. Salty Watermelon isn't bad by any means. Not bad at all, if you don't mind drinking red tonic water that smells like watermelon. Apparently, I don't.